As I go off and act all non-local...well, hold up. I'm being local in California by representing the East Coast while drinking of their local goods! Actually, this topic of 'local' reminded me of how I got the conversation going (so prescient, I am) between Mr. TJ and Mr. Foobooz. And, it took Mr. Curtin (what's with all of the formality today, uh?!) to recognize it. You'd think with the time I spend at TJs in Paoli, I would have brought notice to you sooner than now. 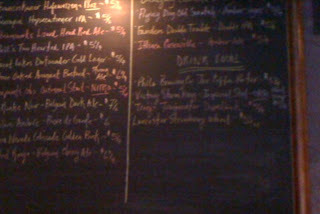 After all, I recall the first time I noticed the Locals Only section of the blackboard as well as on their website. Yet, I looked at and said something like "huh, cool!" and proceeded to order a Yards beer (cask, I believe). 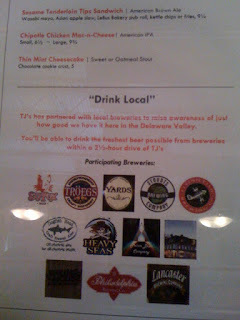 Then, it struck me that this was all part of Jeff's (Mr. TJ, again) plan to take Art (Mr. Foobooz, if you're not connecting the dots) up on a more grassroots local campaign in the area pubs. It seems that just by pulling these neighborly beers together into one section of the menu and ensuring that customers know that they are indeed local (less than 150 mile radius I believe is Jeff's plan?) has done well for the bottom line. As reported at BeerYard.com, Jeff has been going though his local-brewed kegs a bit faster, has 35 waiting in queue, and notices an appreciation of the locals by, well, the locals. I think in this era of reducing footprints, eating local, drinking local, acting local, buying local, etc etc---that this move makes perfect sense. And, to think, all it took was an eraser and a piece of chalk. Ah, these things right in front of my own eyes. Glad you can all carry on without me! Well played gents.